Sweeping social and economic changes triggered by more than two decades of reform in China have led to equally sweeping changes in China’s vast, state-controlled media environment, particularly in the quantity and diversity of media sources and the development of the Internet. The Communist Party of China (CPC) not only tolerates much greater diversity in the media, but has strongly encouraged greater efforts to provide media content that resonates with the lives and interests of the population. Despite these changes, however, all pertinent information continues to be filtered through party censors to ensure that it is consistent with official policy. The party exercises especially tight control over the core mainstream media which deliver domestic and international news along with politically sensitive information. These media constitute the main vehicle for conveying the policy preferences and decisions of the central leadership. 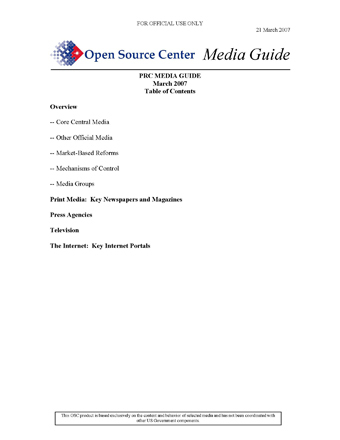 Core Central Media. The primary function of these media is to shape popular attitudes and mobilize support for party priorities rather than to foster public debate or provide a spectrum of views on public issues. The most “authoritative” information — that is, the information that most directly represents the policies of the CPC and government — is carried by China’s official press agency Xinhua; the central television and radio channels, China Central Television (CCTV) and China People’s Radio; the official newspaper of the CPC Central Committee, Renmin Ribao (People’s Daily); and Jiefangjun Bao (Liberation Army Daily) of the Central Military Commission. Other Official Media. While these media organs constitute the core of central mainstream media, there are many other papers, journals, and websites affiliated with central party and government organs and mass associations which target broad segments of the population, such as labor, rural cadres and farmers, or state economic or public security cadres. There are also a variety of specialized central media, ranging from those associated with ministries, such as foreign trade or public security, to those associated with official think tanks and advisory bodies, science and technology institutes, universities, and key party committees. Provincial and local media replicate the pattern of the center, including: official papers, radio and television outlets, and websites of party and government organs, as well as specialized media analogous to those at the center. Finally, the military establishment has its own media system that is anchored by Jiefangjun Bao and consists of newspapers of the service arms and military regions, a variety of specialized and popular publications, and official websites. In addition, China Central Television (CCTV)-7 carries regular programs devoted to military themes and information. (See OSC Media Aid: PRC Television Channel CCTV-7, 13 Sep 05 CPF20050913000141). which is party-owned, the longtime trend to rely heavily on advertising for the bulk of revenue continues apace. In conjunction with these reforms, the party granted considerably more leeway to editors and television producers to use content that satisfies popular tastes and meets market demand while remaining within party-imposed political limits. As a result of this party-driven commercialization of the media, the number of papers willing to test these limits, particularly “metropolitan dailies” [dushi bao] and special weekend editions of major papers, expanded in big cities while the popular “evening” [wanbao] papers enriched their content and a host of specialized new papers emerged. In response to market requirements, the party gave the stamp of approval to a new genre of economic papers to provide the latest economic information to China’s emerging entrepreneurial class and foreign businesses operating in China. These papers often publish information not found in other papers or media, including political information, and have led the effort to further liberalize media controls, especially in south China. Major cities have also begun publishing English-language newspapers to serve the growing foreign business community. The commercialization effort has also spawned a number of glossy newsweeklies patterned after US news magazines. While still controlled within party guidelines, these newsweeklies are given leeway to cover a broader range of issues than mainstream publications such as the long-time Xinhua general affairs magazine, Liaowang. Liaowang launched its own spinoff newsweekly, Liaowang Dongfang Zhoukan, in 2003. These publications are aimed at an educated urban audience, especially professional and commercial elites. The leading magazines differ slightly in emphasis, with some focused primarily on world and national news (e.g. Zhongguo Xinwen Zhoukan), some featuring more social commentary (e.g. Nanfeng Chuang), and some placing more emphasis on cultural trends, human interest, and fashion (e.g. Sanlian Shenghuo Zhoukan). The earliest newsweeklies began publishing in the early 1990s, but the genre became commercially viable and more popular when media reforms accelerated after 1999. Finally, the media reforms have resulted in the establishment of three privately invested national publications — Caijing (Finance), Jingji Guancha Bao (Economic Observer), and Shimin (Citizen) — which were established by investors as commercial ventures. They are all aimed at a high-end readership of urban professionals, new business elites, and government leaders. Since its founding in 1997, Caijing has become China’s pre-eminent financial magazine, offering not only economic information, but analysis and policy suggestions. In addition, Caijing has acquired a reputation for hard-hitting investigative journalism and has run into political trouble a number of times for its exposés of official wrongdoing. The magazine is published weekly by the politically influential and wellfunded media company, SEEC Media. The weekly economic newspaper Jingji Guancha Bao aims for much of the same readership as Caijing. Established in 2000, with a format and layout similar to London’s Financial Times, it too has developed a reputation for hard-hitting social commentary along with timely economic news. With a masthead motto of “rational and constructive,” Jingji Guancha Bao has adopted a lower-profile than Caijing. Its license with the State Press and Publication Administration is registered to the address of a defunct publication located in the city of Jinan in Shandong province, but its director and chief editor are in Beijing where it is published. Shimin is a Guangdong-based weekly magazine of current events and social commentary which made its debut in 2005. Its editorial bias appears to support a civil-society agenda. Although all three publications are privately-invested and often publish material avoided by magazines and papers under the party’s formal umbrella, they are, nonetheless, closely monitored by party censors. Caijing and Jingji Guancha Bao, in particular, appear to have high-level political connections, but all three remain subject to official censure or punishment if they stray too far from politically-acceptable content. Like all other PRC media, they must secure an operating license from the State Press and Publication Administration. A core group of official party and government newspapers carry the party’s message in major issue areas and to key segments of the population. These newspapers are listed in approximate order of their importance — Renmin Ribao, Jiefangjun Bao, Jingji Ribao, Nongmin Ribao, Zhongguo Qingnian Bao, Gongren Ribao, Guangming Ribao, and China Daily. These papers are distributed primarily through internal channels to party organs and government offices; but since 2004, Renmin Ribao, Jingji Ribao, and Guangming Ribao have been available for sale to the public on select newsstands in Beijing. All of them have their own web portals which contain unique information not carried in the paper itself and which provide links to other papers and websites. Qingnian Cankao is a semi-weekly journal affiliated with Zhongguo Qingnian Bao, the daily paper of the CPC Communist Youth League. The journal was established in July 1984 and provides reports and analyses on international political, military, economic, and social developments by Chinese and foreign experts and officials, Zhongguo Qingnian Bao correspondents and commentators, and some foreign media. The journal describes itself on its website as the only comprehensive national weekly to provide a “window on the world” for China’s “elite youth,” defined as college-educated, 20-45 year-old professionals. The semimonthly official journal of the CPC Central Committee, Qiushi, is primarily a theoretical and ideological journal that elaborates the doctrinal rationale for party policies and boosts the ideological authority of select leaders. It covers a broad array of political, economic, cultural, scientific, and social issues, publishes the texts of important party and government decisions, and occasionally carries articles by top leaders. The CPC’s official general affairs weekly magazine for foreign audiences, Beijing Review, is issued in many different languages. The magazine includes major party documents and leadership speeches along with commentary on foreign affairs and features on domestic developments. The magazine often publishes translations of articles that have appeared in domestic media that are not otherwise available in English. China operates two state news agencies. One is the PRC’s official news service, Xinhua, with domestic and international casts. The other news agency, Zhongguo Xinwen She, is targeted specifically at overseas Chinese in Hong Kong and Southeast Asia. Xinhua is China’s official news agency and is one of the three pillars of the Chinese Communist Party’s propaganda system along with the party daily Renmin Ribao and the official television network Chinese Central Television (CCTV). Established in 1931 in the Chinese Communist Party’s guerilla base areas, it is now the largest news-gathering organization in China and provides virtually all international and national news carried in PRC media. It files news in seven languages 24 hours a day (Chinese, English, French, Spanish, Portuguese, Arabic, and Russian). Although formally under the authority of the State Council, Xinhua is the news service of the CPC Central Committee and is managed directly by the party’s Propaganda Department, billing itself as “the eyes, ears, andmouthpiece of the party and people.” The agency also serves as the PRC Government’s interface with foreign news organizations operating in China. Xinhua’s staff of over 7,000 makes it one of the largest news agencies in the world. In addition to its 31 provincial bureaus, 15 branch offices, and 14 reporters stationed nationwide, Xinhua has developed a robust international presence, managing an extensive network of over 100 overseas news bureaus, including regional hubs in Asia, Europe, the Middle East, the Americas, and Africa. It has some 400 news staffers in Hong Kong and Macao alone and maintains three bureaus in the United States, including a news editing desk in New York. It has agreements on news exchanges with news agencies or media organizations in nearly 100 countries. Although still operating within the confines of party-controlled strictures on content, Xinhua has increasingly adopted the operating style, professional norms, and competitive outlook of the major international news services, including establishing training and research centers to increase the professionalism of its journalists. Xinhua hosts one of China’s largest Internet portals, Xinhuanet, and manages the day-today operations of the PRC Government’s official website (see descriptions of both websites in the Internet section below). Xinhua also presides over a vast news, publishing, and business conglomerate that includes China’s main bookstore chain and nearly 40 magazines and newspapers. Among the more prominent of these are the weekly current affairs magazine, Liaowang (Outlook), and its sister newsweekly in Shanghai, Liaowang Dongfang Zhoukan; Banyue Tan (China Comment), a magazine for mid-level cadres; Huanqiu (Globe), a glossy monthly pictorial for popular consumption; and Zhongguo Jizhe (Chinese Journalist), a professional journal for reporters. Newspapers include Xinhua Meiri Dianxun (Xinhua Daily Telegraph), Xinhua’s news bulletin (in English, French, Spanish, Arabic and Russian); Cankao Xiaoxi (Reference News), which, according to Xinhua’s website, is the daily with the largest circulation in China; Jingji Cankao Bao (Economic Information Daily); Guoji Xianqu Daobao (International Herald Leader); and two securities dailies, Zhongguo Zhengquan Bao (China Securities) and Shanghai Zhengquan Bao (Shanghai Securities). Xinhua also publishes Zhongguo Nianjian (The China Yearbook) in Chinese and English versions. China Central Television (CCTV) is the flagship network of the PRC’s state-controlled television system and has been on the leading edge of China’s rapidly changing media environment for over a decade. CCTV has led a move from single-channel, narrowlyfocused programming dominated by party propaganda to a proliferation of channels throughout China’s television system with diverse programming and news-packaging and with viewer-friendly formats and styles modeled after those of the West. As in other areas of China’s changing media landscape, market forces have played a significant role in transforming television. The network reaches over 90 percent of China’s population. The center and the provinces increasingly compete for television ratings and revenue. Contributing to the competition, all provinces have satellite channels and permission from central authorities to broadcast in other provinces. Hong Kong television is now available legally in China’s neighboring Guangzhou city, and China’s new urban elites increasingly have access to foreign television through illegal satellite dishes or in upscale neighborhoods with majority foreign populations where pay-for-view cable television is now offered. To retain younger urban Chinese who increasingly get their news and other programming from the Internet, CCTV in 2004 launched Internet TV programming and is making aggressive efforts to develop online video services and digital pay-for-view programming.